Which one should I upgrade next? Personally I would do the luck/incendiary one. You can get crit damage/crit chance from badges. Of course it depends what else you have on your hunter. I'd definitely go with the Harrier. Burning (tough) walkers from a distance can be the difference between one or two shots needed to kill em. Hmmm, I would upgrade none. Would wait for a better option. But sometimes, you cannot wait that long @zeeblack . 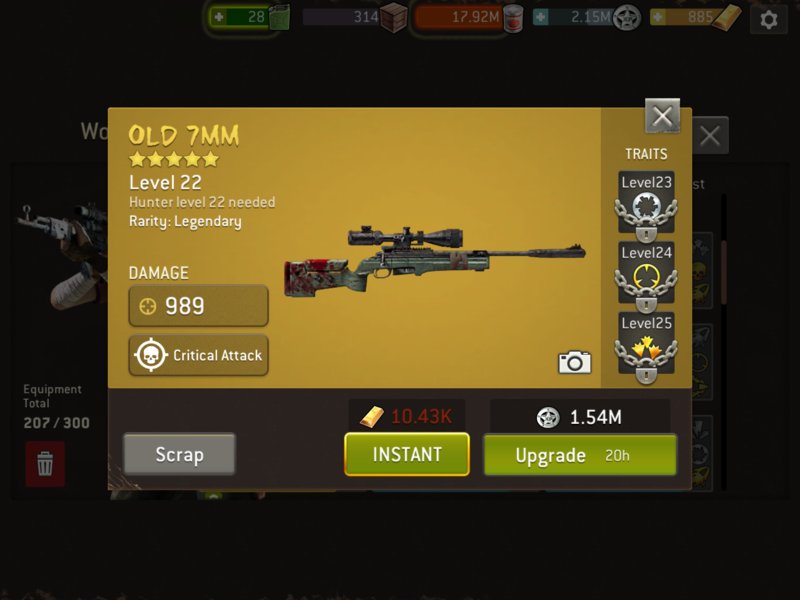 I was damn lucky with my only lvl22 rifle(luck/piercing/bore, upgraded 6+ weeks ago), but since than I´ve got some fair epics and pretty bad ones from distance mode. I agree with zeeblack. I would not upgrade either one. Wait for better ones. Both are perfect Sasha rifles. I would upgrade the harrier first. Agree with others. Would skip them and wait for a better one. Upgrade gear from lv22 to lv25 costs a lot of XP, should do it wisely. If you need a rifle, like I do, the Harrier is the one I go with. The luck would boost any survivor trait you have and the burning is extremely helpful (imho). The drawback to burning is if you use a melee survivor, I found when I pair it with a warrior/bruiser, I generally do more damage to myself when striking the burning walkers, that I created. So really it would depend on who you assign it to and who runs with them. Dwight and burning makes good work of fatties/armored/humans. Elder member of the Super Greens Family! Currently level 34, but watch me go! NOT COOL! WE DON'T NEED THREADS FILLED WITH RECRUITING POSTS. THIS ISN'T FB! There's a s section for guild recruitments. I wouldn't recommend posting recruiting references in others threads!!! Harrier all the way. Trust me. I was killing with a level 19 maxed just like it. Miss the wide caliber.